Hapless 23 year old Taras Krohe is torn between two women; while that’s a situation most lads his age would envy, the women in Taras’s life are his mother, an eccentric but kind-hearted Romanian woman who can see not fault in her son, and Katya, his Russian ex-girlfriend who recently dumped him for a middle-aged pony-tailed aesthete. “Mami” isn’t too sympathetic to Taras’s plight; she says he’s better off without the Russian but you get the feeling that no girl would be good enough for her “pourchi”. Taras and his mother have lived for years in the same one and a half bedroomed central London flat; ten years after winning a scholarship to a good private school, Taras now works for a company in the city, the unfortunately named IBS while his mother scrapes a living taking in sewing. All pampered Taras has to worry about is how he’s going to win back Katya, – that is until Mrs. Bartlett dies and everything starts to unravel. Since the death of his father when Taras was just a baby, Mrs. Bartlett has been a distant but unexplained benefactress – the landlady of their flat and a governor of the school that Taras went to. After the funeral Mrs. Bartlett’s son Gideon, a former classmate of Taras just returned from the States with a glamorous but vacuous girlfriend in tow gives the Krohe’s notice to quit their flat. With nowhere to got things look bleak and Taras resolves to get Gideon to change his mind but why is his mother so set against Taras getting involved? And why would Mrs. Bartlett’s solicitor Mr.Banerjee pay so many visits to Mrs. Krohe? Poor Taras, the more he tries to help, the more things go wrong for him and the more his mother tries to deter him, the more curious he is to know the truth. The thing that struck me most about this entertaining read is that this is a novel set in contemporary London that acknowledges the issues faced not only by immigrants but also by native Brits but doesn’t try to be ultra cool. The characters have flaws but are intrinsically good; Taras is a walking disaster zone but always means well. The plot is essentially a comedy of errors, some with more serious consequences than others; author Penny Rudge strikes s a good balance between light and dark but never straying too far from the bounds of credibility as she has her characters lurch from delight to despair. The plot is quite intricate but it’s kept more or less tidy though I felt that the time scale was unclear towards the end. I was also a bit confused a couple of times when trying to identify the some of the characters but neither of these two niggles affected my enjoyment. The idea of the character of Mami is inspired but doesn’t always work well in practice. She’s meant to be from Bukovina, a very rural part of Romania but her use of English sounds more like that of someone whose first language is one of the Slavic ones although she occasionally lapses into excellent English, correctly using quite complex grammatical constructions that sound wrong coming from her mouth. This aside she’s a wonderfully engaging character with lots of charm and lots of cheek to go with it; she’s complex too and this is what stops her from becoming too much of a caricature. Does she really rely on Taras? Sometimes she seems needy and vulnerable and others she’s streetwise and tough. When Taras starts digging around you’re forced to really consider whether Mami is everything she claims to be. Mami may refuse to let Taras go but I got a strong sense that Taras is more than happy to stay, perhaps painting her as more needy than she really is. Taras is unthinking rather than unkind, something his friends clearly understand as they put up with his presence on the sofa; when he finally breaks free from Mami, independence is not as he imagined it would be. There are some nicely observed scenes of office life and a hilarious account of a department night out which ends with Taras attempting to extricate himself from a Viking helmet. There are a few tried and tested jokes that rely on the differences between American and British English. There’s a hint of Bradbury in the characters and situations with comedy villains and a cast of quirky but likeable characters. Now and then Rudge tries to throw in something more serious – Taras’s encounter with Katya on an office night out being a good example – but these darker elements of the story tend to get lost among the more farcical aspects which is a shame as their impact is lost, but generally Rudge manages to keep a finely tuned balance between the more serious ideas, and maintaining lively entertainment. This was an impulse buy and I wasn’t disappointed. It’s not great literature but it’s a fun read with engaging characters and a surprising story. Recommended. 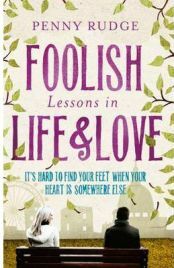 No Comments on "Foolish Lessons in Life and Love"